All cash on delivery parcel will be sent by INDIAN POSTAL. Usually it takes 5 to 7 days based on your location. In COD option you may have to go to local post office to collect your parcel. Usually we send with DTDC or SPEED Post. You can track your courier parcel here. Please call us at 9637907060 for more info. 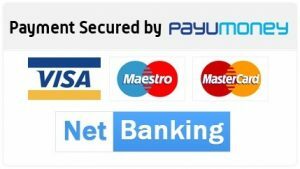 If you want to pay with debit/credit cards or with internet banking please click PAYUMONEY button below.